As I said, I was going to Quartzsite, AZ. The Rubber Tramp Rendezvous would be the first stop on my 2013 trip. Riley and I left on Friday, January 4th, planning to get to Ft. Stockton, TX the first day, then make stops in Deming, NM and Casa Grande, AZ. A big storm had just come across west Texas, and I-10 was closed from Ft. Stockton to El Paso. No biggie, though, because I would stop in Ft. Stockton and by the next day be able to get to New Mexico. Unfortunately, my engine had other plans. I started feeling problems with how much gas it was burning and pulled over on the side of the highway. Then I couldn’t get the engine restarted. Luckily I have Coachnet service and they sent a tow truck. He (David at Sheffield Towing, super nice guy) loaded the Lazy Daze onto the the truck and dropped me off at Fernandez Auto Service, about the only shop in Ft. Stockton that is open on Saturdays. That was a long, cold night. 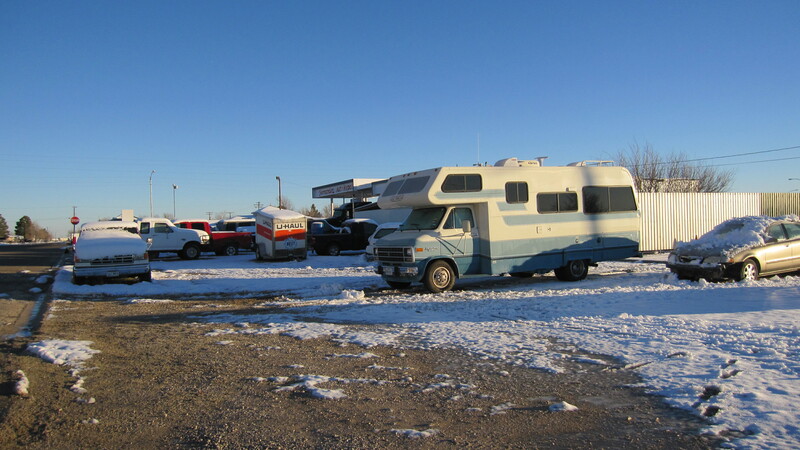 But the next morning, after clearing ice off the shop driveway, Mr. Fernandez got the RV pulled up to the shop and began to diagnose the problem. For some reason the fuel injector was giving too much gas. My dad was on the phone with Mike, my favorite mechanic back in Georgetown, and they had some ideas of things to check. It took until about 4:30, but the problem was found to be a temperature sensor. (Diagnosis delayed a few hours because the first temperature sensor replacement part was defective.) Happily, I was able to get to an RV park in Ft. Stockton for the night, and got back on the road on Sunday morning, only losing one day. 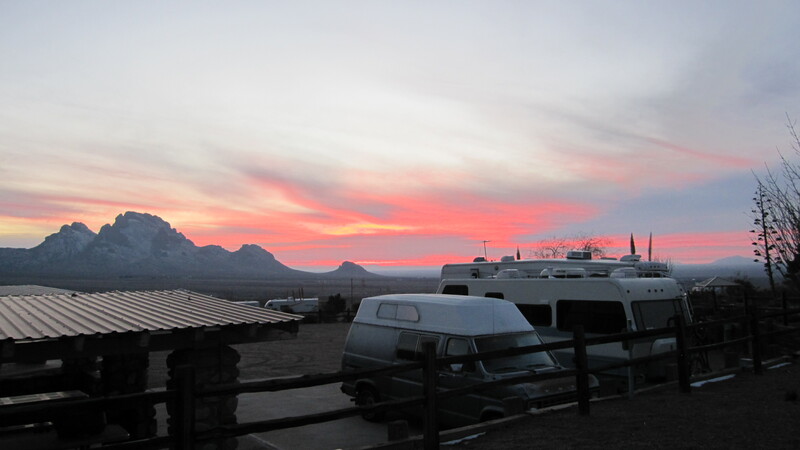 On Sunday I made it to Deming, stopping at Rockhound State Park, where I had a nice visit last year. Unfortunately, every spot with electric hookups was full. But they were using the group site as overflow, and I was able to squeeze into a space there. It was going to be a cold night and I needed to run the electric heater. Sunset over Rockhound State Park and my little spot. I made it to Casa Grande on Monday. 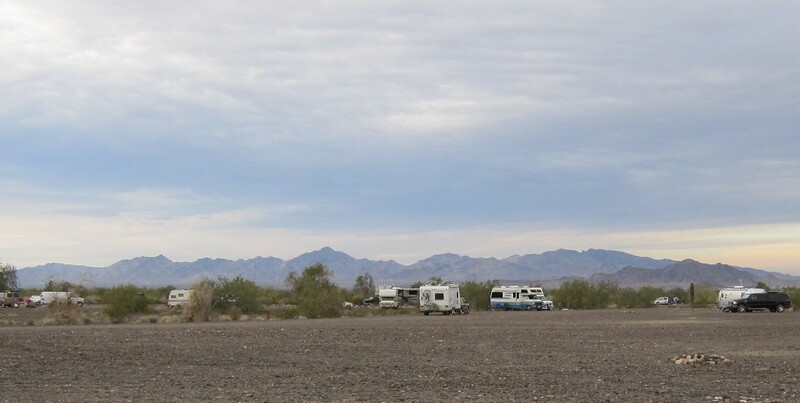 After stopping at Walmart and picking up everything I would need for a couple of weeks in the desert outside Quartzsite, I found a site at the Escapees park RoVers Roost. I did a bit of laundry, took care of the tanks and filled up on propane (at $1.85 per gallon, nice!). By Tuesday I was quite excited to be so close to my destination. I got to Quartzsite around noon and immediately went to the Pitstop to fill up my water tank. 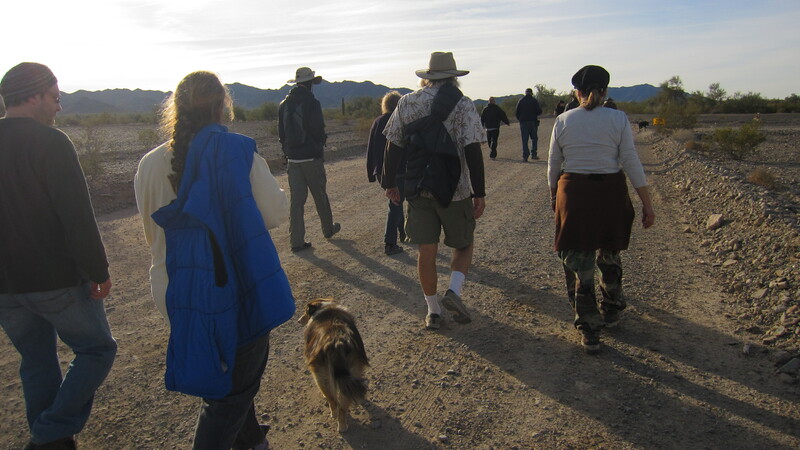 Then I headed to the location of the Rubber Tramp Rendezvous (the RTR). I knew a few people who would be there (like Randy, CB, Tish and Laurie), but hoped to meet many more and learn about living mobile. Starting to fill in. 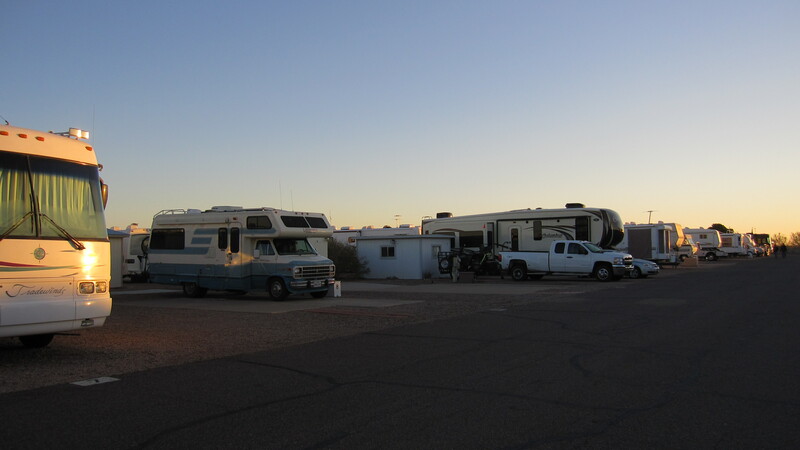 Randy’s trailer (to the left of mine) and CB’s Airstream (far right). On our first full day here (Wed., 1/9) CB drove us around and Randy introduced us to the sights, including the Hi Jolly (Hadji Ali) grave. 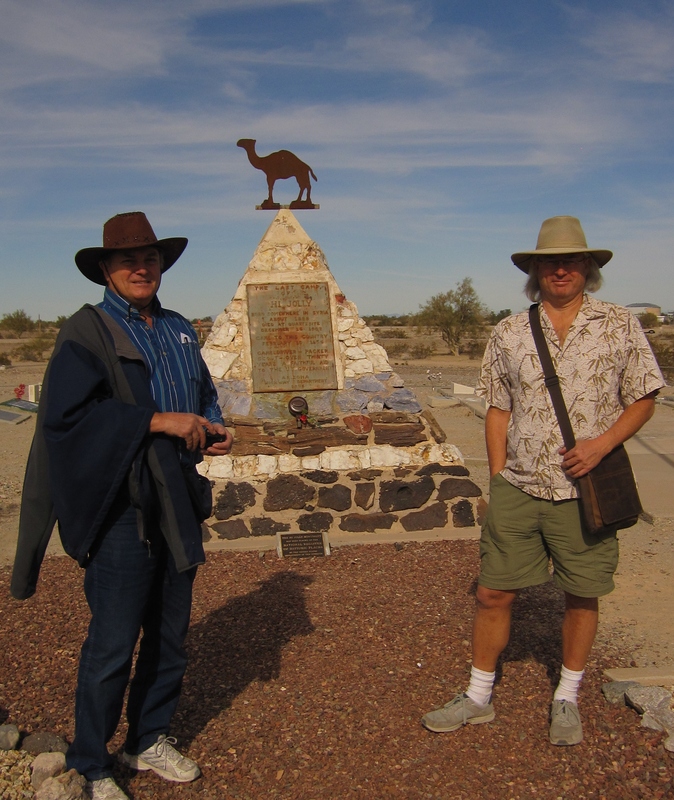 Randy (left) introduced CB and me to the sites of Quartzsite, including the Hi Jolly (Hadji Ali) grave site. The RTR has been going GREAT! Bob Wells has organized it very well, with interesting seminars, morning and evening walks, campfires, group dinners (and a breakfast), and lots of people helping people. On our 8:30 AM walk. 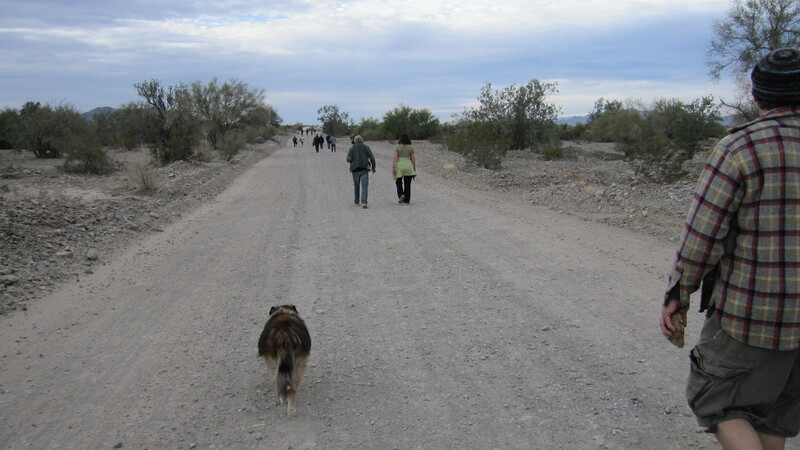 Riley’s herding. We also have an evening walk every day at 5’ish. It’s a great opportunity to have a talk with someone new, and get some good exercise. And for Riley to have a nice long walk. Last Saturday we had a group breakfast. Myrna arranged it and Bob bought the food. We cooked pancakes, sausage, eggs (I was the egg cracker/mixer), and toast. Also, CB cooked up some bacon. We have had a major cold snap and the overnight temps have gotten down to around 19-20, with days only into the 40’s and quite windy. It has started warming up again. We are all having so much FUN and learning a lot. I am so lucky to be here doing this!! 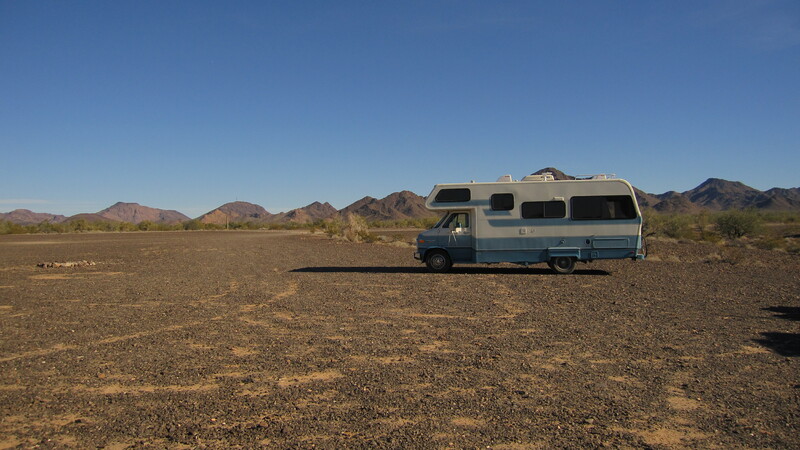 This entry was posted in Arizona, Bureau of Land Management Campgrounds by ontheroadwithriley. Bookmark the permalink. I’m jealous…..all my old friends having fun without me….sure do miss you guys!!! Tell everyone I said “Hi”…. Hi Barbara! Yes, it was good to have the resources to help with the repair. Having a great time, especially now that the weather has turned nice. Will go to the big tent show on Mon. or Tues. Hugs to Katie too! I’ll bet it feels nice to be in one place (with so many friends!) for awhile. You’ve covered some long distances! Looks like there’s warm temps in the forecast for “Q”. Yay! Hi Maureen! Oh yes, nice to be in one place after the pace I kept up last year. And with my traveling friends and warmer temps it’s perfect!